As a business we play a crucial role in reducing the impact we have on the environment. We are committed to conservation of natural resources, minimisation of waste and maintaining the natural environment. We are always striving for best practice in environmental management and sustainability. We work in partnership with our clients to find sustainability improvements, reduce environmental impact of waste, improve recycling levels through management and education and maintain vigilance to ensure environmental incidents do not occur while also being prepared to act swiftly if they do. BIC’s cleaning activities are guided by our Environmental Management System (EMS) which has been integrated into business planning and operations at every level. We are members of the Green Building Council of Australia and our Environmental Policy applies to all our activities at worksites and Head Office. We actively encourage consideration and respect for the environment and ensure that appropriate training is provided for all employees and contractors on their responsibilities for environmental management and protection. BIC have made it a priority as part of our commitment to minimise the use of chemicals in our working environment and reduce the health impacts for all employees by improving indoor air quality. The use of Microfibre cleaning products has been a core part of our Environmental Plan. These products are designed specifically to improve the productivity of staff, reduce the cost of cleaning and more importantly reduce environmental impact. Sustainability statistics form a critical part of the reports that are available to you at a site level. The reports allow us to work together on making continuous improvements and innovation in our approach to sustainability. They give you transparent insights into the metrics and criteria most important to you, allowing decisions to be made across the sites to reduce your environmental footprint. Microfibre technologically is a cleaning solution which allows for the elimination of toxic chemicals and replaces them with water. 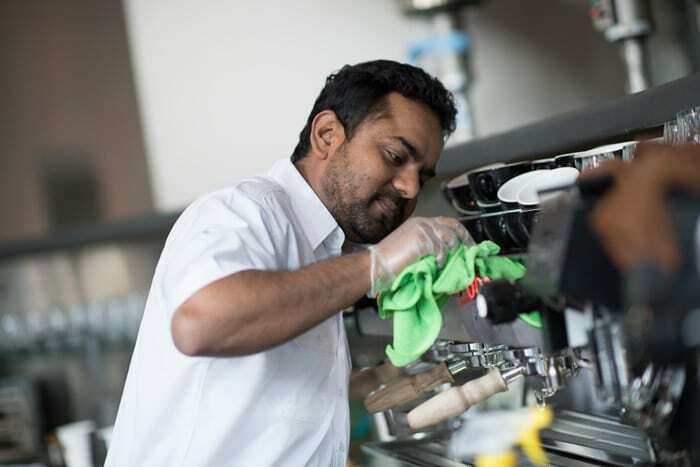 Microfibre Technology has several advantages such as no need for detergents, is reusable up to 300 times, reducing costs further, improves the quality of cleaning at a bacteriological level. Additionally, they are lighter physically easier to use, floors take less time to dry reducing likelihood of accidents and are colour coded products (e.g. mops and cloths) are used to prevent cross infection. For safe cleaning of all green buildings BIC makes an important contribution to the quality of the workplace environment in its choice of cleaning products. We are committed to the use of biodegradable cleaning products. We will only use chemicals when it is absolutely necessary for us to do so. With approximately 23 million tons of waste going to landfill each year in Australia, disposal of waste is an area of particular environmental concern. BIC’s aim is to promote a sustainable environment and reduce costs by reducing the volume and toxicity of waste. Our waste management system targets the waste at the source by streamlining the collection process. Encourage an efficient and cost-effective approach to industry waste reduction. We recommend the introduction of Centralised Station Bins at key points within each office level. 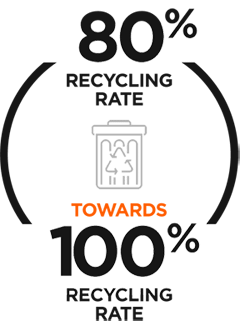 This encourages staff to consciously consider which bin an item goes into and helps to stimulate awareness of environmental issues at the workplace and at home. BIC in partnership with our clients and all tenants will assist your building to excel in recycling. We encourage all tenants to adopt a “Zero Bin” policy. This means no under desk bins so as to minimise contamination of waste streams. 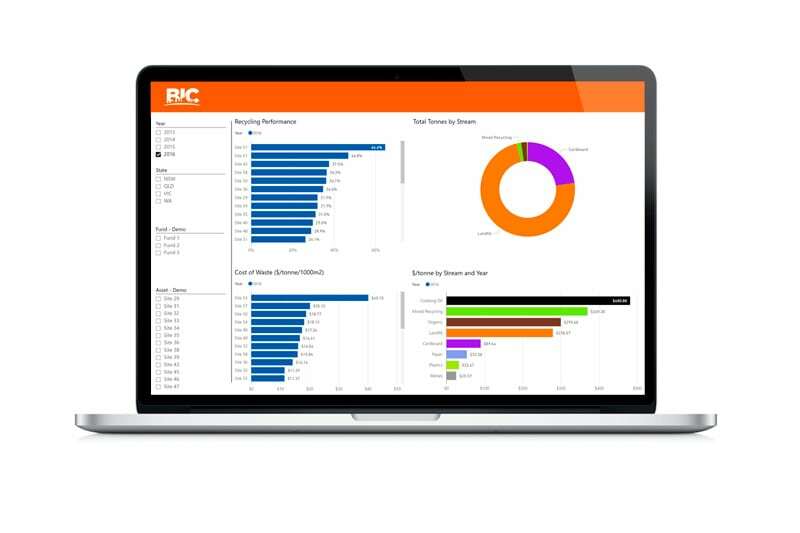 BIC reporting and statistical analysis gives you accurate information on quantities within the waste streams and ownership of the improvements of recycling rates. It also provides valuable information on how we can work together in developing strategies and plans for the future. Our monthly reports will provide a percentage split of landfill vs recycling based on the disposal and removal from the buildings. This provides us with transparent figures which in turn will identify the problematic areas which are creating greater volumes of landfill; enabling our EHS Team to step in and find a solution to further improve recycling levels.